France, within the European Union, demonstrates a strong attachment to European democratic values. In Europe, individualism prevails against collectiveness. 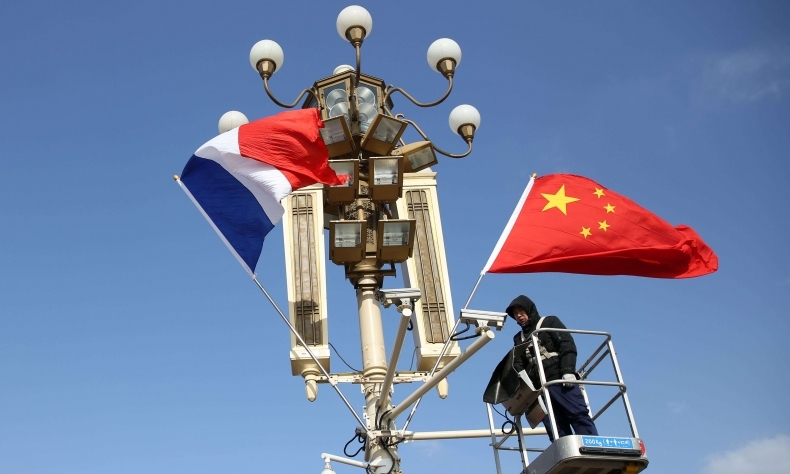 Fifty-five years of French-Chinese amity have marked the relations of both countries since the historic vision of General Charles de Gaulle in 1964. The French president at the time had measured that the Chinese people were representatives of a great nation. Despite the scars of history, great individuals have found their place at the table of great nations. De Gaulle had anticipated the “Chinese renaissance”. In 55 years, all the French presidents, from Louis Giscard d’Estaing to Jacques Chirac, and Francois Mitterrand to Emmanuel Macron, have followed the same policy that we can qualify as “more exchanges for more confidence”. Thereby, the areas of cooperation have been very wide－aviation, automobiles, sustainable cities, energy, health, agriculture and so on. On important world subjects, confidence and a strong friendship have been affirmed, characterizing our relations. How can our relations evolve? The year 2019 will be particularly important in terms of strategy, because the two heads of state will conduct important official visits to each other’s country, and many discussions will be organized. Those meetings at the top level of the state are very advantageous, and even more so amid the global tensions we are facing. Our bilateral relations are characterized by three circles. The first circle is the one that encircles our societal systems. Chinese authorities have stated their attachment to “socialism with Chinese characteristics”. People who thought that the policy of reform and opening-up would drive China on the road of the West were wrong. Consequently, the two models of modernity, founded on different options, are abutting. Within such diversity, cooperation is built on the respect of reciprocity and the knowledge of cultural systems and direct dialogue, through effective channels. The second circle is related to global vision. Here, our positions are similar. We are both at a multipolar equilibrium of the world. Multilateralism is the road to peace with a shared future. In most recent times, we have been able to see the importance of China’s decisions－its support of the euro in the face of the debt crisis as well as the Paris climate agreement. We can also recall the positive attitude of China toward international organizations such as the United Nations and UNESCO. The objective of a shared destiny of humanity can unite us. A great project of the future for our cooperation can be our new impetus that must be given to multilateralism. It is clear that we must reform and not give up. France and China can contribute together to creating the multilateralism of the 21st century. The Belt and Road Initiative can help reinforce the equilibrium of global economic exchanges. Both sides can benefit from it in terms of projects and companies’ growth. China has also recently been multiplying international initiatives that are beneficial to the strategy of cooperation. French-Chinese agreements are a good start and can promote cooperation on a variety of projects in developing countries, such as those on the African continent. The response of Europe on the Belt and Road Initiative must be active and efficient. Accordingly, Presi-dent Macron announced at Xi’an, the capital of Shaanxi province, the participation of France in the initiative toward a “win-win” situation. Overall, we can find optimism when it comes to the future of French-Chinese relations. The analysis of the three circles demonstrates that the space for cooperation is at the center of our mutual interests. We should never forget that when we speak of a Sino-French partnership, culture has an important role to play in our discussions. Both our civilizations are ancient and share a mutual respect for each other. The coming of the fourth French-Chinese cultural summit in Nice in October will be proof of that. Let us not forget that culture transforms confidence into a long-lasting friendship. Jean-Pierre Raffarin is former prime minister of France. The views expressed do not necessarily reflect those of China Focus.